Last Thursday MG and I had the pleasure of joining a small group of friends and kindred spirits to meet Grant Petersen, the owner and founder of Rivendell Bicycles in Walnut Creek, Calif.
Grant was at College Park Bicycles in College Park, Md., adjacent to the University of Maryland campus, on the latest stop of his tour to promote his new book about practical cycling called Just Ride. Grant signs Leslie T.’s book, with Colin and Mary Lauran. Grant is in a good mood after a nice ride. 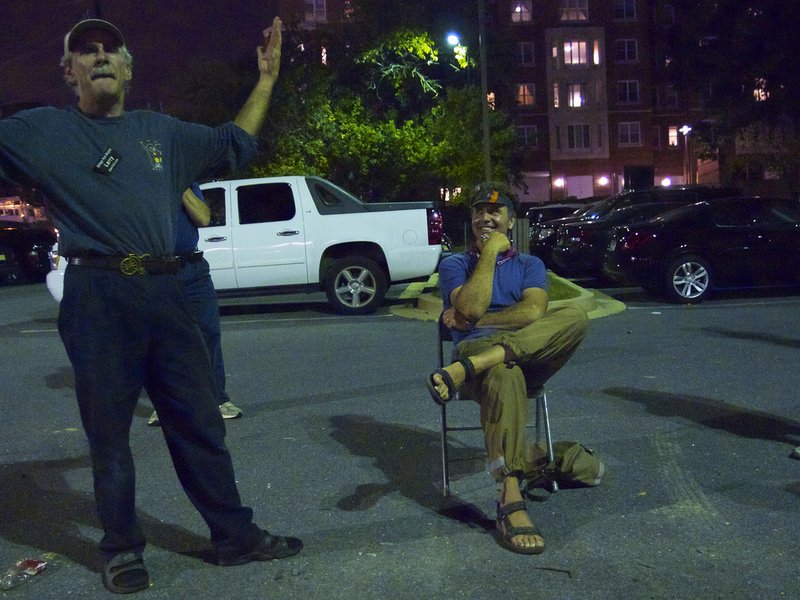 Grant went on a local ride with a group from the shop and then a small group of us gathered in the dimming light in the parking lot for an informal talk and q-and-a session. 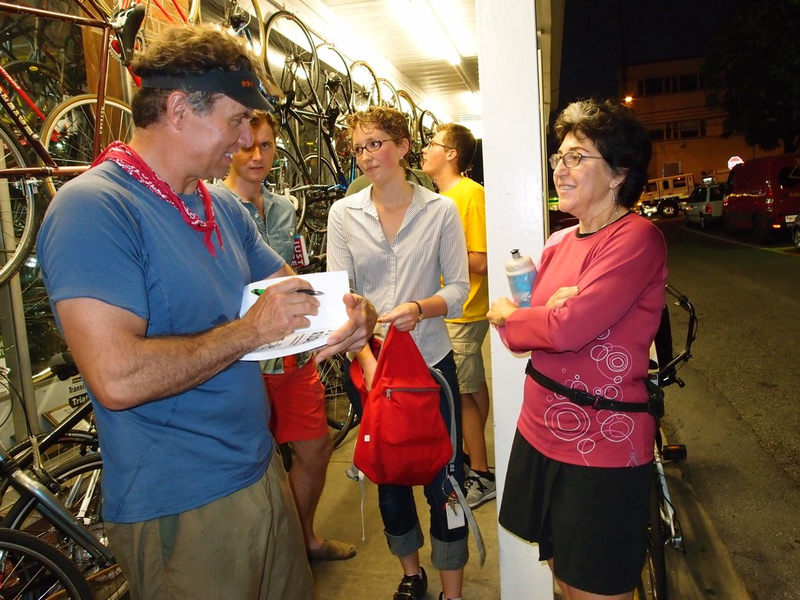 Shop owner and bike impresario Larry Black started things off with a short talk about his own history as a bike shop owner before ribbing Grant for writing “fried” instead of “friend” in his signed copy. Larry talks about all sorts of things. Grant is amused. Larry pretty much didn’t mention anything about Grant being an ahead-of-his-time advocate for cycling as transportation and recreation, and as a maker of lugged steel bikes for people who don’t race. 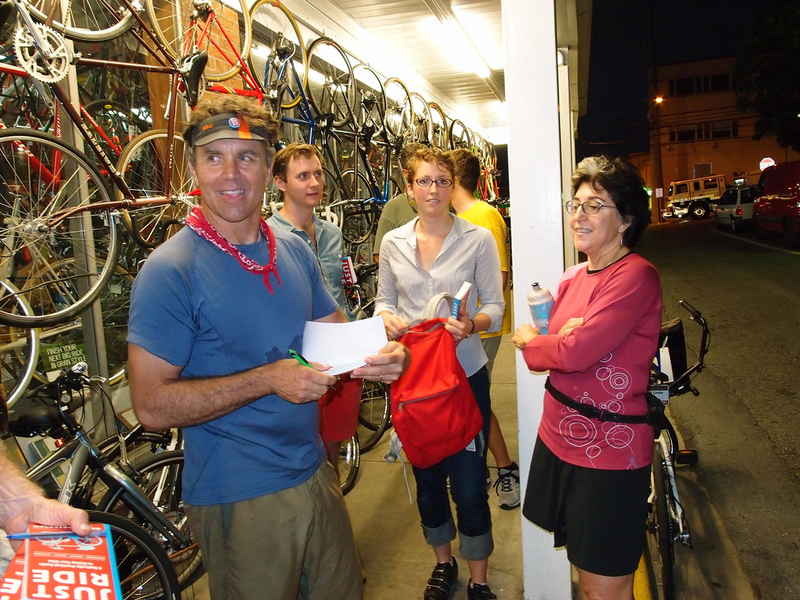 Larry did talk about how he sold bikes that competed with Bridgestone when Grant ran that company’s U.S. operations before founding Riv in 1994. Anyway, Grant just giggled at Larry, signed his book again, and then talked about the substance of his new book. It grew out of another 90,000-word book he wrote that neither he nor his publisher particularly liked, so he started over. Grant ended up with the 89 short essays in the book on regular bike riding, fitness and a few controversial topics like racing (or, un-racing, as Grant puts it) and lycra. Grant takes a question from the group. 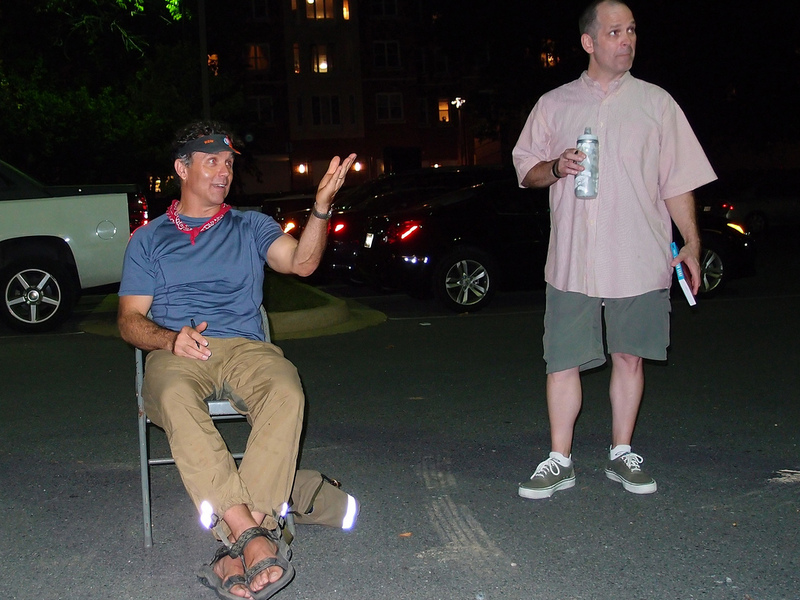 A highlight was when pal Joan O. asked him about the section in the book about burpees, a squat/pushup/jump full-body exercise that Grant recommends to cyclists in addition to the exercise they get on the bike. We all got a good chuckle out of that. And, Grant looked in excellent shape. 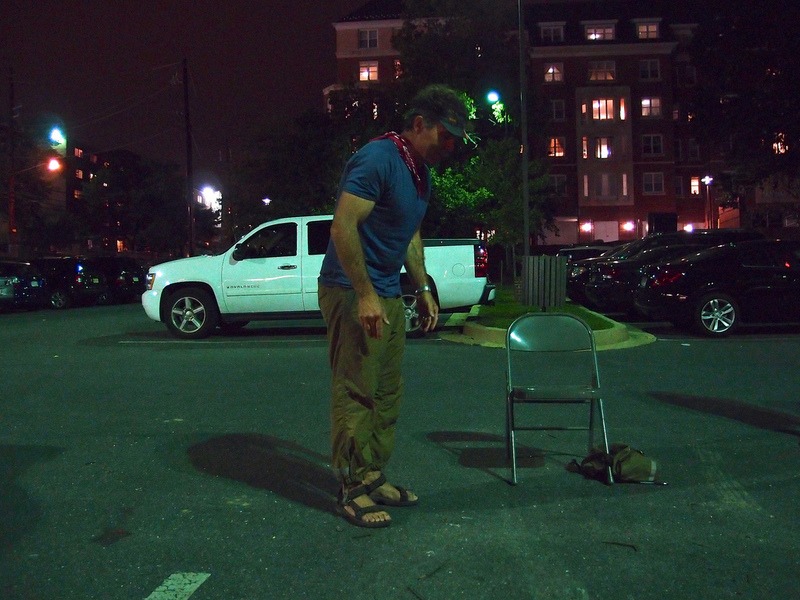 Grant prepares to execute a burpee. I asked Grant whether he feels any pressure to make his bikes more detailed in response to the resurgent hand-made bike builder scene, which he gently deflected with a comment that other people are doing good work in that sense and he was glad to stick to his own aesthetic. Afterwards I urged Grant to make the Riv tandem he’s talked about in the past — and he assured me it will happen at some point. He did say folks like us may have to buy in before production will happen. I also asked that the rear top tube be made to 29 inches or longer. For taller stokers, that allows a good forward reach. To my surprise he said that length, long by current tandem standards, would be the minimum. He might go longer so that stokers could use upright bars if they want. That was music to my/our ears! We pretty much have to buy a custom to get a long enough reach for MG with most manufacturers using 28-inch or at most 29-inch rear top tubes. Far from the image some have of him as an opinionated cycling idologue, Grant came across as a thoughtful, moderate person who is not against anything in particular. He’s mostly an advocate for cycling that is as he put it, “not work” — as in, not working toward a speed goal or a fitness goal. Rather, he suggested we work on our strength and weight loss through off-the-bike exercises and save cycling for fun trips wherever we care to go. A fine idea! Many thanks to Larry Black (sorry for the teasing, Larry!) for bringing Grant to the D.C. area. And if you’re reading this, Grant, please join us at Friday Coffee Club in downtown D.C. next time you are in town. I enjoyed this post– thanks for the summary of his talk. I would love to see a Rivendell tandem in production someday– I bet it’d be a beaut! Thanks Lisa. Sorry you could not be there. We’ll see about that tandem. I’ve been bugging Grant for years to get on with it. It won’t be cheap, which I suspect makes it hard to bring to market. Glad you posted this. I’d have loved to come to the talk but couldn’t. Nice to get this sense of what it was like to hear from Grant in person. Nancy, thanks for commenting. Grant was really gentle about his opinions.